Who Are Venezuela's Presidential Candidates? A woman wearing a T-shirt depicting Venezuela's opposition leader Leopoldo Lopez takes part in a protest against upcoming presidential elections, in Caracas, May 16, 2018. Venezuela holds a presidential election on Sunday with incumbent leftist leader Nicolas Maduro expected to win, given a boycott by the mainstream opposition which says the vote is rigged to perpetuate a "dictatorship." The election comes amid a crippling economic and social crisis in the once-wealthy OPEC nation. Venezuela's President Nicolas Maduro greets supporters during a campaign rally in Charallave, Venezuela, May 15, 2018. The 55-year-old former union leader and bus driver does not have a university degree and proudly calls himself Venezuela's first "worker president." Maduro has long promoted himself as the heir to "Chavismo," the political movement begun by his late predecessor Hugo Chavez. His policies have remained very much in line with the maverick former leader. His friendship with Chavez began in 1993 when Chavez was in jail following a coup attempt. "I will follow that man wherever he goes, I told myself. And that's the way it was," Maduro has said. Maduro first entered politics in 2000 as a National Assembly legislator. He rose to become the body's president, a role his powerful wife Cilia Flores would eventually take over. As foreign minister from 2006, Maduro was a faithful ambassador expounding Chavez's views around the world. He won plaudits from diplomats for his affable style and cultivated important friendships in Russia and China. In late 2012, Chavez, suffering cancer, named Maduro vice president before endorsing him as his heir. "He was a bus driver. How the bourgeoisie mock him!" Chavez laughed. That vote of confidence helped Maduro narrowly win the presidency in the April 2013 election, soon after Chavez's death. Maduro largely continued Chavez's policies of nationalizations, currency and price controls and social handouts. Critics saw this as further damaging Venezuela's economy and say reforms then would have helped avoid today's crisis. During Maduro's tenure, hyperinflation has soared and supermarket shelves have emptied. Looting and rioting are common across the country given shortages and power outages. Voter disaffection propelled the opposition to win the 2015 parliamentary election, its first major electoral victory in nearly a decade. Maduro blames Venezuela's crisis on an "economic war" waged by Washington and the opposition. He promises to win that war should he be re-elected though critics point to his lack of reforms over the last five years. Venezuelan independent presidential candidate Henri Falcon makes public his proposed government program at a news conference in Caracas, April 23, 2018. Falcon is a 56-year-old former soldier and governor of Lara state. From humble roots, he studied law at a Caracas university. His candidacy is controversial and he has been criticized by much of the opposition, which decided to boycott the election. In the eyes of many, Falcon only serves to legitimize Maduro's inevitable win. On the pro-government side, Falcon is widely seen as a traitor, having initially backed Chavez and then broken with the Socialist Party in 2010. His key policy is to dollarize Venezuela's economy, replacing the bolivar which has weakened well over 99 percent against the dollar since Maduro came to power. At rallies, he likes to give out mock $100 bills. If elected, he says he will give a monthly welfare stipend of $25 to every adult and $10 to every child, and raise the minimum monthly wage to $75. He would also end strict currency controls. Falcon and Wall Street heavyweight Francisco Rodriguez, his chief economic adviser, also plan to reform state oil company PDVSA, the government's cash cow, by separating it from the Oil Ministry, asking the Organization of the Petroleum Exporting Countries to raise quotas and strengthening the role of foreign partners. Falcon plans to free more than 200 jailed activists and politicians should he be elected, and allow foreign humanitarian aid into Venezuela. 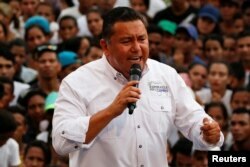 Venezuelan presidential candidate Javier Bertucci of the "Esperanza por el Cambio" party, delivers a speech to supporters during his closing campaign rally in Valencia, May 16, 2018. His candidacy has gained more traction than expected, not least thanks to popular soup handouts, but he is still seen as having little chance of success. He has no known political experience and had little name recognition in Venezuela prior to running.